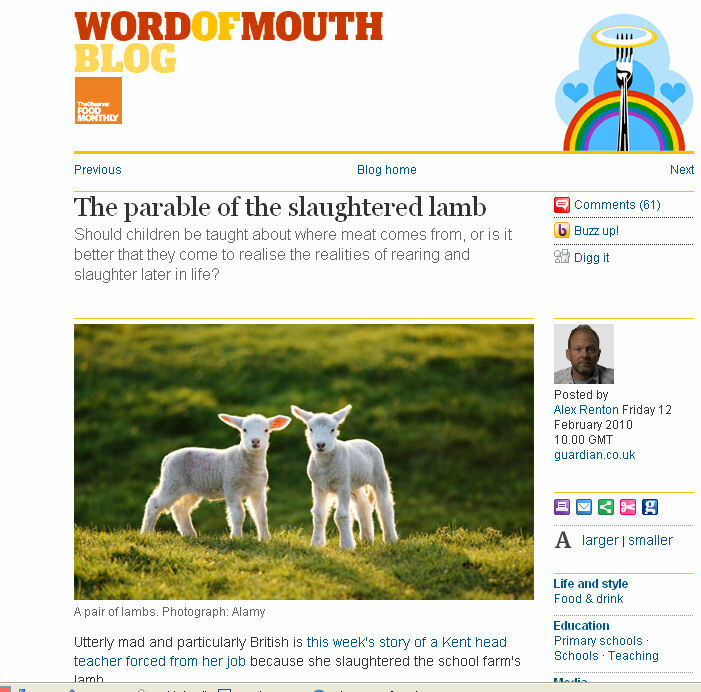 I remember noticing a story in the news a few months ago about a head teacher vilified and threatened for attempting to teach children that the lamb on their dinner plates comes from the cute wee woolly things in the fields surrounding their school. There was more to it than that, of course, but that seemed to me to be the gist of it. This morning I received an email from Peelham Farm in Berwickshire drawing my attention to an article in last Friday’s Guardian, all about the issue. Peelham Farm is dedicated to producing organic pigs, sheep and beef as compassionately/respectfully as possible. They attempt to reconcile our desire to eat animals with the right (my word) of farmed animals to be treated as well as possible while they survive, and our responsibility (my choice of word again) to provide that sort of treatment. They started a scheme last year whereby up to 12 families/individuals at a time can own a Tamworth pig, which will eventually be slaughtered and turned into the yummy pork products of the owners’ choice. This scheme was drawn to my attention by the multi-talented and ever-vigilant Mango Terrier (who may also have had a paw in the creation of the Peelham website), and after some discussion it was agreed that Piglet, Piss-Piss and I could join in but on a slightly different basis. We now have a pig–Philomena–but she’s going to be a breeding sow rather than a bacon sandwich. I mentioned all this in a couple of postings some time last year. Anyway, Peelham mentioned the article because they, in turn, were mentioned by the article’s author, journalist Alex Renton. He and his family had a pig from Peelham last year, and I think they may have another one there now. In the light of his experience he was interested in the case of the primary school head teacher, and so that’s what his article is about. On all sorts of levels the way the teacher has been treated seems to me to be crazy. I wouldn’t mind betting that the parents so opposed to allowing their children to know that burgers come from live animals, and concerned at the harm that might be imparted by the sharing of that knowledge, would have a great deal in common with the other bunch of nutters parents who made special journeys to their children’s schools, during Jamie Oliver’s attempt to introduce some real food into school dinner menus a year or so ago, in order to pass them processed crud through the railings so that they didn’t have to come face-to-face with a vegetable. Compassion in World Farming is the only charity I’m a member of. They’re in no way one of the nutty animal charities, and they’re not campaigning to stop people from eating meat. They’re simply attempting to improve conditions for farmed animals. Here‘s a link to a short film they put up today about veal available in London, and the confusion that sometimes surrounds its origins. You are currently browsing the archives for the Farmed animals category.